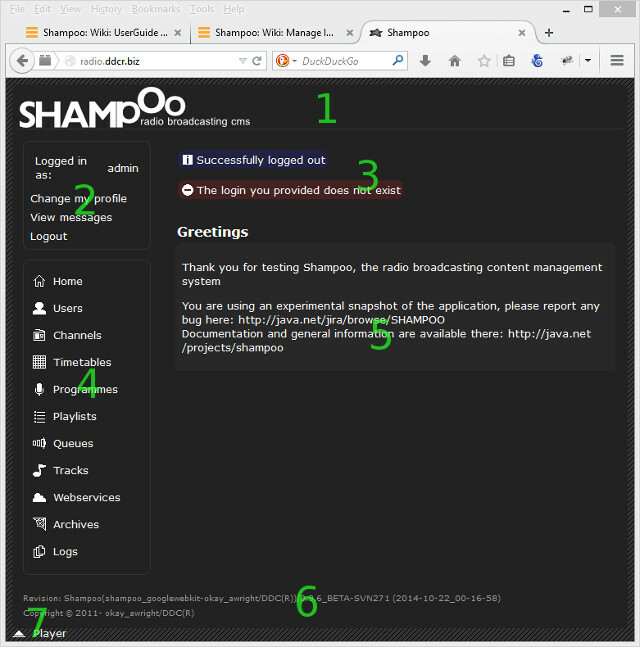 This section covers how to use the web frontend for Shampoo. The web frontend allows you to fully perform all the tasks related to the management and administration of your radio stations from one single location. Most, if not all, features of Shampoo are unavailable until you log in. Your login and password should have been handed over to you by one of your Shampoo platform administrators as well. There's a Forgotten your password link located on the site frontpage that you could use if you ever forget or have lost your credential codes. Once logged in, the web frontend should look similar to the picture displayed below. Note that it may not look identical if Shampoo has been branded or customized. A header, with branding information and miscellaneous informations about this version of Shampoo. A user login box. All data related to your own personal account are gathered here. A notification box. Which is only visible when notices and results of operations are available for you to read. Miscellaneous informations are circled in blue, warnings in yellow, and errors in red. A menu sidebar, that gives you access to all Shampoo features, sorted out by themes. Note that not all features may be available to you. It depends on your credentials when you log in. See the related note on credentials for more information. Available menu entries are: Users, Channels, Queues, Timetables, Programmes, Playlists, Tracks, Archives, Webservices, and Logs. A main panel, that is updated according to the selected menu entry. Specific sub-features may also be accessed from within popup dialog boxes. A footer, where copyrights and version informations are displayed. A contextual popup that you can hide and show on demand. The embedded radio player is available from there.